Your local government plays a vital role in our state’s economy. Have a great success story about your city services? Share your story now. 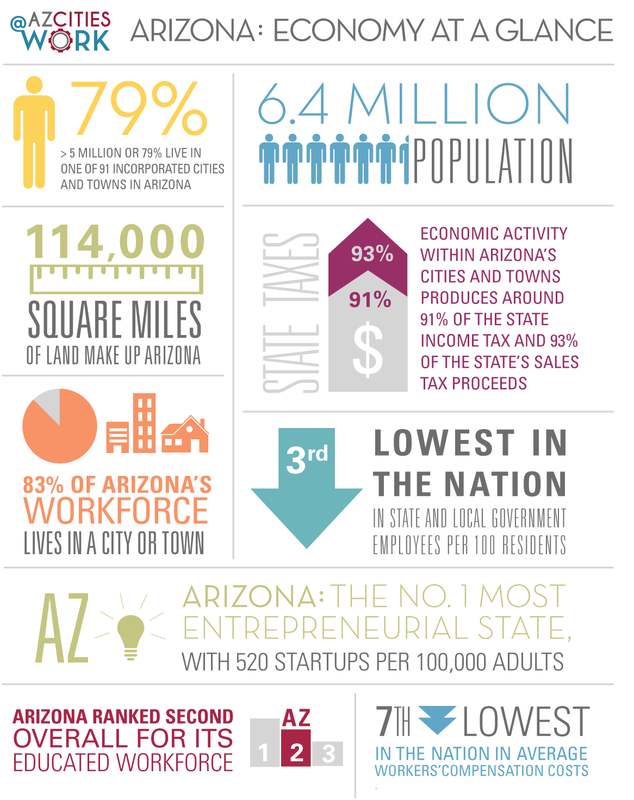 Cities and towns are the economic engines of the state of Arizona. What does that mean? The numbers are quite amazing. Out of a state with more than 114,000 square miles and a population of around 6.4 million people, more than 5 million 79 percentlive in one of our 91 incorporated cities and towns. And, when it comes to employment statistics, 83 percent of the states workforce lives in a city or town. Together, the economic activity within cities and towns produces around 91 percent of the state income tax and 93 percent of the states sales tax proceeds. No wonder that cities and towns mean business in Arizona. Moreover, Arizona cities and towns serve a critical role in attracting and retaining businesses to our state  from Intel, Raytheon, Honeywell and First Solar, to the local bakery on your corner. When site selectors look to relocate or expand their businesses, theyre not just looking at what land might be available at what price, but also the quality of the local workforce, infrastructure to support their project, local school districts, quality of life, local and state tax rates, as well as the local economy. Arizona is ripe for business activity  in the summer of 2012, the Kauffman Index of Entrepreneurial Activity ranked Arizona the no. 1 most entrepreneurial state, with 520 startups per 100,000 adults. According to the Arizona Commerce Authority, Arizona ranked second in overall workforce by CNBC for its educated workers. The cost of doing business in our state is also low: Arizona represents the seventh lowest in the nation in average workers compensation costs. We also have the third lowest number of state and local government employees per 100 residents, according to the Beacon Hill Institute. What does that mean? It means in your city or town, weve got a focus on business. Cities and towns are actively engaged with several regional economic development entities and the Arizona Commerce Authority to ensure were doing all we can to bring jobs to Arizona. And, were partnering with businesses in all phases of the development process to create an environment that lets local businesses do what they do best.